Cathay Pacific and Dragonair suggest two loyalty programs for their passengers: “The Marco Polo Club”. the loyalty program, and “Asia Miles”, the travel reward program. Each program may be used individually, although used together they bring more benefits and make it cheaper simultaneously. The following information will definitely help you to choose the best option. Asia Miles may not suggest you priority boarding or lounge access directly, but it offers a range of benefits for the earned miles, including an opportunity to upgrade to first or business class. The range of partners below enables you to earn the miles, provided by Asia Miles program. This includes Air New Zealand and Air China, Skyteam’s China Eastern, and also to Aer Lingus, Alaska Airlines, Gulf Air, Jet Airways and Royal Brunei; Qantas, British Airways, Malaysia Airlines, Qatar Airways, and of course, Cathay Pacific itself. The first step to start using the benefits of Asia Miles is rather simple – you need to enrol on the Asia Miles website. That’s it. Now you can earn miles and use all the benefits of the program as its member. You can earn the miles with the following companies: Cathay Pacific, Quants and other Oneworld members. Let’s consider each way. 1. Cathay Pacific will credit you with miles, according to your seat and the cost of your ticket. For instance, travelling in business class will bring you about 1.25 points per mile. It makes about 7,470 Asia Miles if you are going from Hong Kong to London. 2. Qantas and other partners will offer you the same number of Miles for business class. However, economy class travellers will get a bit different number. They have flexible numbers of Miles unless your tickets were bought with a kind of discount (in this case you will not get any Asia Miles) for the flight. 1. In case, if you want to redeem your Miles for a flight you should be aware that you will be credited according to the number of miles flown. The important thing here is that you’ll get almost twice more Asia Miles if you chose a return trip, instead of two one-way tickets. 2. Certain airlines make it possible to upgrade the tickets to the next class. Note, that there is no way you can skip a class. It means you cannot upgrade from the lowest to the highest class directly. As for the type of tickets, the situation is pretty similar to the above variant. The return trip will be a better deal, than taking two one-ways tickets. Besides, the service enables Asia Miles members to upgrade their seats right after they confirm the booked tickets. Speaking of benefits, a business class upgrade is a great use for the Asia Miles. In fact, Cathay Pacific is not the only company to provide the upgrading service. The Dragon airlines are also dealing with it within China. Again, the best option is to upgrade the return trip. Here are some details on business class upgrading process. 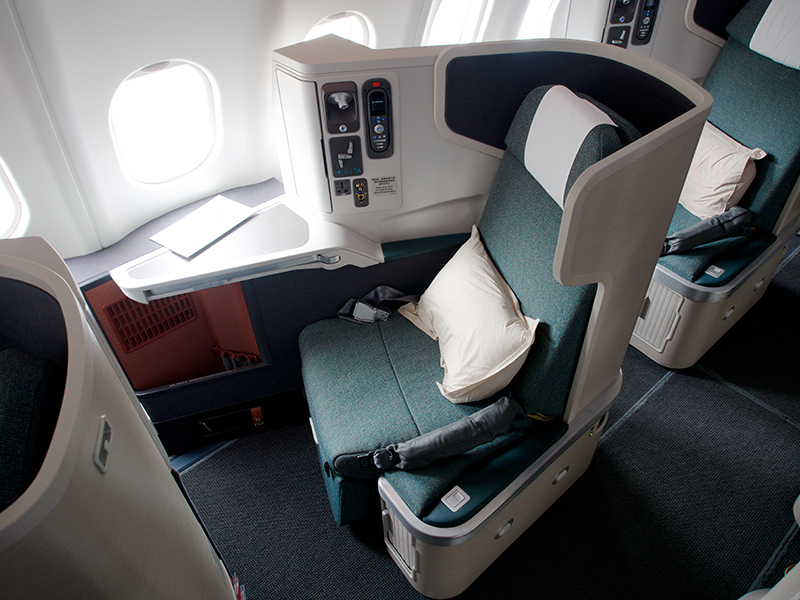 Business class upgrades with Cathay Pacific are +1 upgrades. The point is that economy class tickets can be substituted with business class ones, but with premium economy class tickets. Imagine a scale of classes from lowest to highest – this is how it works. You cannot jump over a class or two unless the company does not offer the class you need. Then, it is allowed to jump over the unavailable class and get a business class ticket, for example. While planning a trip, you should also remember that there may be some limitations on both the upgrades number and type. In some cases, the Miles cannot be used for upgrading. It depends on the type, of course. Usually, such types include the cheapest tickets or those, which were bought with a discount. The process itself is pretty simple. You may use the Asia Miles website to confirm the upgrade provided by both Cathay Pacific and Dragonair airlines at any time. If you decide to use the upgrading service and are looking for a specific ticket for its further upgrading, it is better to verify if the required class is available. It will not take much time, but will definitely save your money and will reduce the chances that you’ll be disappointed with your trip. Another way to confirm the upgrade is to do it right at the airport. You need to have a member’s card and a route to confirm it. You can use your Asia Miles even at the last moment – the only condition is the required seat availability. Asia Miles program provides a great variety of benefits and opportunities for the passengers. Think which one will work for you and take its benefits.